how the back garden is right now. Maybe just a little less snow. But just a little. So ... I can't see the dirt. Or the grass. Or really anything on the surface of the ground. 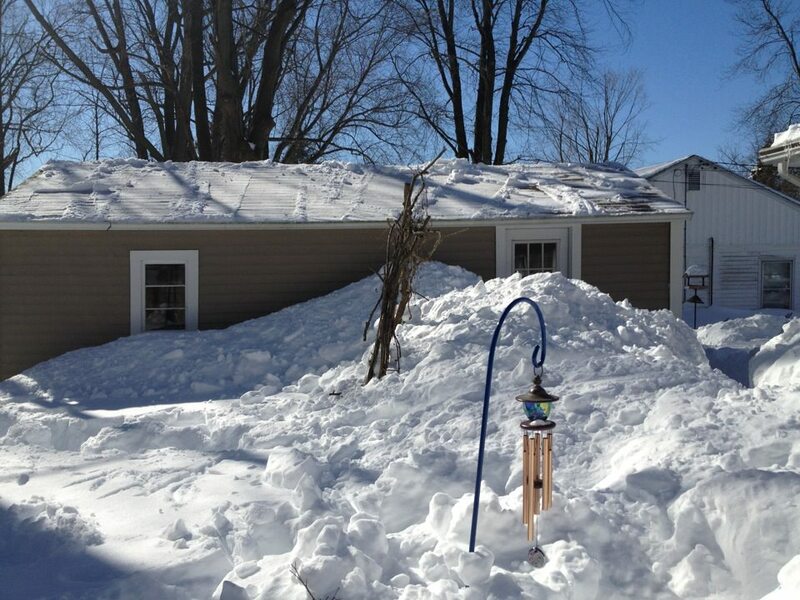 All I can see is about four foot snow drifts. Everywhere. And there's more snow on the way. So let's be honest - there won't be any peas planted on St. Patrick's Day in my neck of the woods. Maybe you are luckier than I am. So I am adjusting the calendar a wee bit for this month. - It's time to start more flower seeds indoors and under lights! Think New Guinea impatiens (or impatiens if you are in an area not affected by the blight), salvias, ageratum, calendula, sweet Williams, coleus, snapdragons, some cosmos and portulaca. I will start tomato and sweet pepper seeds during the last week of March. Perennials such as delphiniums, yarrow, foxgloves and carnations can still be started in mid-March as well. Sweet peas, grown just for their flowers, can also be started outdoors as soon as the ground can be worked since they enjoy cool weather. -Vegetable seeds can also be started this month. During the last week of March I'll start my pepper, tomato and eggplant seeds under lights. Broccoli, leeks, cabbage, onions and celery can also be started. You can start lettuce seeds indoors as well, but I usually wait until they can be seeded outside. Sow peas as soon as the ground can be worked and it appears that winter has moved on, once and for all. 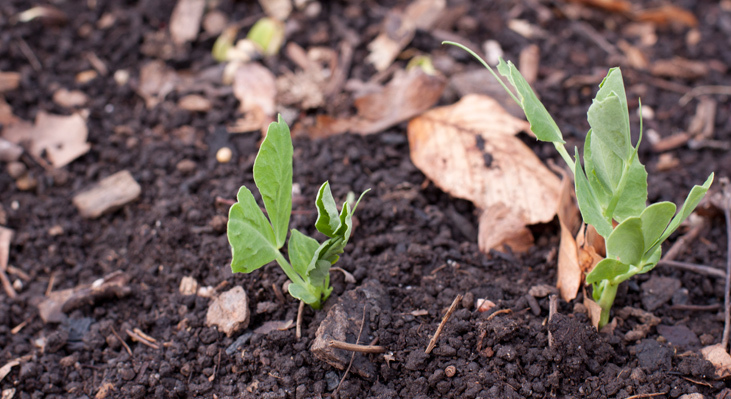 Peas are less likely than other seeds to rot in cold, damp soil. It's also important to get them started early before the heat moves in. Peas produce in cool weather so to get the most yield, you need to beat the heat. - Finish pruning fruit trees by mid-March. Make sure you don't leave stumps along the trunk where the branches are cut off, and aim for nice, clean cuts. This helps prevent infection in the tree. You can take your fruit tree prunings and put them in a vase of water to force flowers indoors. Or, you can dry pear and apple sticks, which make great rabbit treats. - Wisteria can be pruned, but don't cut off the flower buds. I grow Amethyst Falls, which is a less invasive version of wisteria. If the shape of the plant is fine, you can leave it. 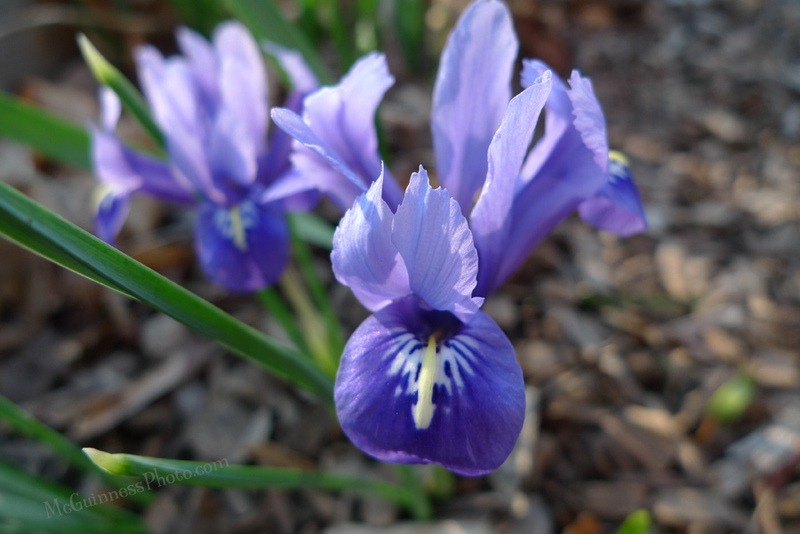 Iris reticulata is one of the first minor bulbs to bloom in the spring. - Roses can be pruned when the forsythia begins to bloom. - The earliest of spring bulbs, such as winter aconite and snowdrops, will start appearing soon. Buy bulb fertilizer now so they can be fertilized when new growth begins to appear. - Once the snow melts, you can start thinking about cutting back perennials so that new growth can emerge as the weather gets warmer. I usually hold off on doing this until the ground is safe to walk on: if it's too wet, you can compact and damage the soil. - Clean out old nests in birdhouses to encourage use this year. - Raspberries need thinning in order to grow well. If a stem had fruit last year, cut it out. If it's thinner than a pencil, cut that out as well. Raspberries produce fruit on new stems. Everything left can be shortened about 12 inches as well. This is also a good time to check that the supports for raspberries are in good shape. Last year I used twine and 6 foot poles to keep everything contained, only to find in mid-summer that a solitary wasp was cutting through the twine and letting everything loose. I plan to put in a more permanent support this year, like this model I found through Pinterest. Hoping the snow melts soon so the season can truly begin! Onward!